Ryan Lavigne holds up one of his day-3 fish that helped him capture the B.A.S.S. Nation title. As much as Ryan Lavigne enjoys fishing off the front deck, he’s proven lately to be extremely proficient competing out of the back of the boat, too. After winning the non-boater division at the B.A.S.S. Nation Central Divisional at Lake Guntersville to earn himself a spot at the B.A.S.S. 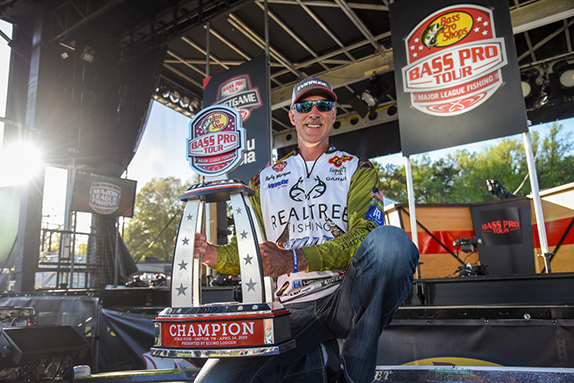 Nation Championship at Lake Conroe this past weekend, he went on to lap the field in impressive and improbable fashion at the venue that will host the 2017 Bassmaster Classic roughly four months from now. He competed as a non-boater for the first two days at Conroe and by the end of day 2, he’d built a 6 1/2-pound lead over the entire field – boaters and non-boaters – and ran away with the non-boater title by nearly 13 pounds. After the final day was pushed back a day due to high winds, Lavigne punctuated his performance with a 24-00 stringer Sunday – he competed as a boater against the top 10 boaters from days 1 and 2 – and ran away with the B.A.S.S. Nation victory with a three-day total of 58-03. 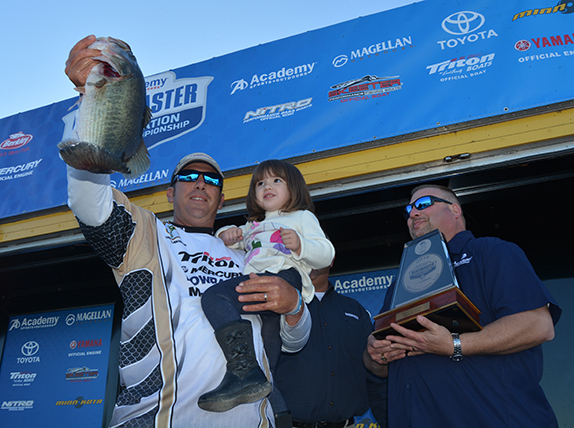 Idaho’s Darrell Ocamica was a distant 2nd with 41-12, a deficit of nearly 16 1/2 pounds. “I don’t know if my feet have landed on the ground yet,” Lavigne said Monday while making the five-hour drive from Conroe to his home in Gonzales, La., where he competes as a member of the Ascension Area Anglers fishing club. It’s been quite a year for anglers from Gonzales. Fellow Gonzales residents Gerald Spohrer and Robbie Latuso qualified for the 2017 Elite Series through the Bassmaster Opens. Former Forrest Wood Cup winner and Elite Series Angler of the Year Greg Hackney also hails from Gonzales, which was ravaged by flooding earlier this year. “Maybe the flood we had brought us some good fortune,” Lavigne said. Lavigne’s victory came in the first B.A.S.S. Nation Championship contested with a new format that sent the top three finishers, regardless of their home region, to the 2017 Bassmaster Classic. Previously, the top finisher in six separate regions at the Championship locked up Classic berths. 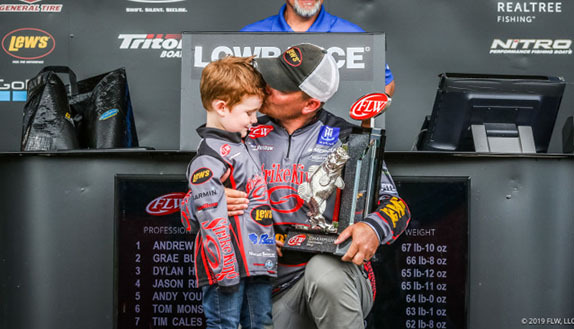 Lavigne, along with Ocamica and former FLW Tour winner Timothy Klinger, are headed back to Conroe for the Classic in March. Here’s a recap of how Lavigne conquered Conroe from the back (and front) of the boat. Lavigne figures he spent just shy of two weeks at Conroe prior to it going off limits last month. It was during that time he identified a couple patterns that he figured would hold up come tournament time. “I had some pretty good practice days and I knew if I could get to my boat (day 3), I had the chance to do it,” he said. “It all depended on how big of a deficit I had to make up, though. I never thought I’d be leading going into the last day, especially by 7 pounds. The field was allowed three days on the water last week and one additional day before the tournament began last Thursday. Lavigne practiced with a boater from the Louisiana team on the official practice day and was able to get a better feel for what he’d found before. One challenge to practicing to be a non-boater was he forced himself to keep an open mind because he knew he could be at the mercy of where the boater wanted to fish. “It was a huge adjustment,” he said. On day 1, he was paired with Jason Vaughn, who is from Delaware. The two worked together well, Lavigne said, hitting spots both had found in practice. They focused almost exclusively on docks. 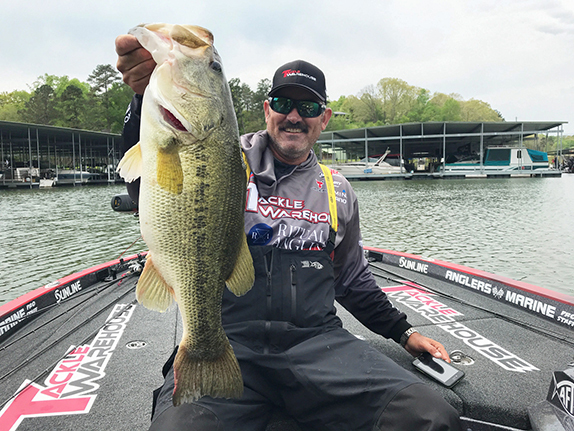 While Vaughn used a jig, Lavigne went with more of a finesse flipping presentation, rigging a Missile Baits Tomahawk on a 1/4-ounce standup jig head. His four-fish stringer weighed 11-14 and had him in 2nd place among non-boaters after day 1. “I figured with the way practice had been and the first day seeing how they were biting, I figured I’d be pretty close (to leading),” he added. For day 2, Lavigne drew Japanese boater Naoaki Ishikawa, who had zeroed on day 1. Before launching, the two talked through an interpreter and Ishikawa had no issue with going to some of Lavigne’s waypoints. They started on some docks, but Lavigne said it was a slow go. He had a 3-pounder and a 5-pounder in the boat by 11 a.m. when they idled out of the creek they’d been in. It’s a place that he looked at last Monday and caught a 16-incher on his only cast. He finished his limit there with a crankbait before dashing to another section of protected docks close to the ramp in advance of a cold front that was moving in. He upgraded once on the second stretch of docks and wound up with 22-05 to capture the non-boater title. He commended Ishikawa for being willing to go to his spots. Ishikawa did not catch a keeper on day 2. Winning the non-boater side came as a bit of shock to Lavigne. When the tournament resumed Sunday morning, he was in control of his own boat and more than 6 pounds ahead of the field. He immediately went to the offshore spot that had produced for him on Friday. He eventually left after the bite slowed down and upgraded a couple times elsewhere. He returned to the hump around the same time he fished it Friday and caught three more upgrades to get to 24 pounds. > Lavigne said the dock pattern evolved during the tournament compared to how he caught them during practice. > Cranking gear: 7’3” and 7’7” medium-heavy Phenix Maxim casting rods, Shimano Citica casting reel (7.1:1 ratio), 14-pound unnamed fluorocarbon line, Strike King 5XD crank bait (various colors). > Flipping & Jig gear: 7’2” medium-heavy Phenix M1 casting rod (flipping), 7’8” heavy-action Phenix M1 casting rod (football jig), Shimano Curado casting reel, 20-pound unnamed fluorocarbon line, 1/4-oz. unnamed standup jig, Missile Baits Tomahawk (lovebug), 1/2-oz. Delta Lures football jig, Missile Baits Twin Turbo (green-pumpkin) trailer. > Lavigne finished 19th in points in the 2015 Louisiana B.A.S.S. Nation points, which were used to determine who advanced to the Central Divisional at Guntersville. The top 10 qualified as boaters and 11-20 made it as non-boaters. Had he finished with two fewer points, he’d have finished 21st and not made the Louisiana state team. > Lavigne, who works as a process technician for Marathon Petroleum, has a lot to sort out and think about this week. As the winner of the B.A.S.S. Nation championship, he is given an invitation to compete on the Elite Series next year. B.A.S.S. has given him until Nov. 28 to pay the first deposit toward the 2017 Elite Series. If he declines the Elite Series bid, Lavigne will still receive paid entries into two divisions of the Bassmaster Opens in 2017, one for winning the non-boater division and another for winning the overall title. For winning the non-boater title, he won a Skeeter/Yamaha boat package with a Minn Kota trolling motor and Humminbird electronics. For being among the top three finishers overall, he also won use of a Toyota Tundra truck and a fully-rigged Phoenix boat for a year.